Powell didn't want to visit Washington after tiring of recruiting visits. But she, and the Huskies, are glad she did. Ella May Powell was tired of the recruiting process and was tired of making visits. She didn’t want to travel from her home in Fayetteville, Ark., to visit the University Washington. 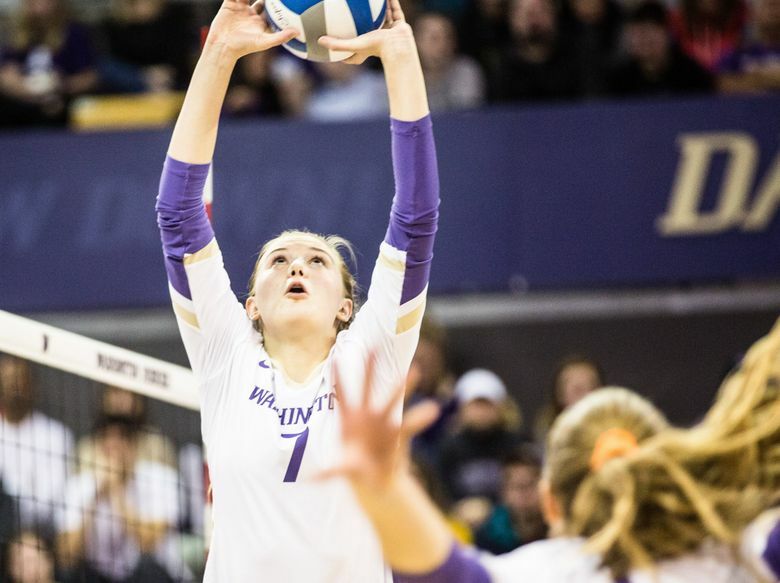 Thankfully, for Powell and the UW volleyball team, Powell’s parents gave her a nudge. Actually more than a nudge. It all worked out. Powell, the starting setter as a true freshman, has helped lead UW (20-12) into the Sweet 16 of the NCAA tournament. The unseeded Huskies continue action Friday at 3 p.m. against Penn State (25-7), the No. 8 seed, at Stanford, Calif. The match will be televised on ESPNU. Among the schools Powell let down in the recruitment process was Arkansas, her hometown university, where she served as the Razorbacks’ ball girl as a kid. But Powell, heavily recruited as one of the nation’s top high-school prospects, said she wanted to get away and see new things while also playing for a high-level program. That Seattle “was the prettiest place she had ever seen,” and the fact UW was looking for a new setter were bonuses. She has started every match, with nearly every possession going through her. In basketball terms, she is the point guard, and she shoulders a lot of responsibility for a freshman. As you might expect, there have been ups and downs in Powell’s first year, both for her and the young Huskies, with just one senior. They finished 10-10 in the Pac-12. That included a five-game midseason losing streak, and for the first time since 2011, they did not host in the first two rounds of the NCAA tournament. UW coach Keegan Cook knew he was asking a lot of Powell. Powell has gotten help from former Husky setter Courtney Thompson, who had her number retired after leading UW to a national title 2005 and going on to win Olympics silver and bronze medals with the U.S. national team. Powell is proud of “how hard our team has worked every day in practice,” and it paid off as the Huskies just aced two big tests in the NCAA tournament. They went to Omaha, Neb., and defeated Saint Mary’s in four games, then swept host Creighton, the No. 9 seed in the tournament, to make it to the Sweet 16 for the seventh straight year. The challenge gets tougher in the tournament’s second weekend. Penn State, the No. 8 seed in the tournament, is an elite program, tied with Stanford for the most national titles with seven. In 2013, Penn State beat UW in the NCAA tournament semifinals before winning it all. Speaking of Stanford, if Washington defeats Penn State, it could face No. 1 seed Stanford next, but the Cardinal first must face Washington State, the No. 16 seed. Her parents made the trip to Omaha, and have come twice to Seattle to watch their daughter.